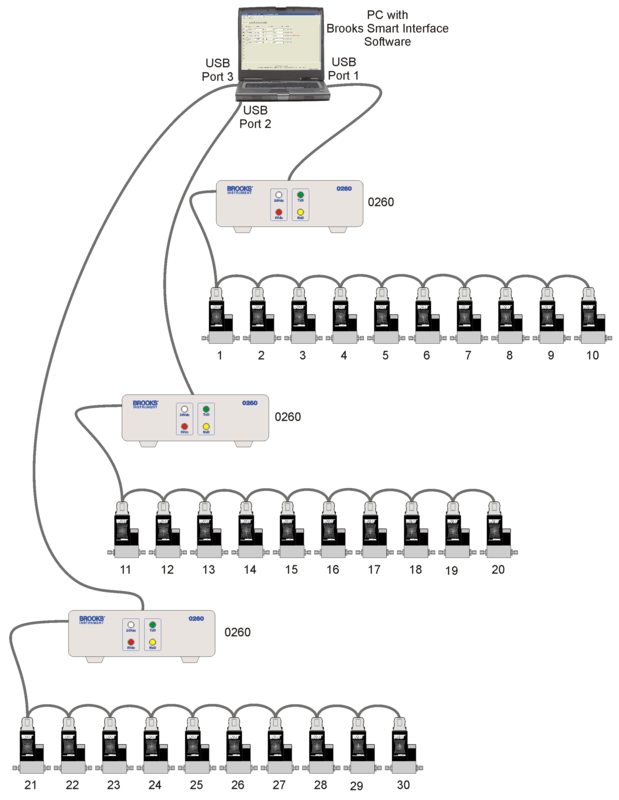 Many options are available when setting up an RS485 network. The goal, of course is to get better control of your system. There are some solutions that make setting up both small and large RS485 networks easy. Digital MFC's and electronic pressure controllers from Brooks Instrument include an RS485 communications option, typically utilizing the Smart protocol. Small Networks - Less Than 10 Devices For a smaller network of less than 10 devices, a simple non-powered, USB-to-RS485 converter can be utilized. However, here, we will show an off-the-shelf turnkey solution that uses a powered converter. An example of a turnkey solution is: •Brooks Smart Interface software, and •0260 power supply/converter Large Networks -10 or More Devices For a larger network of 10 devices or greater, a powered converter should also be selected for best performance results. 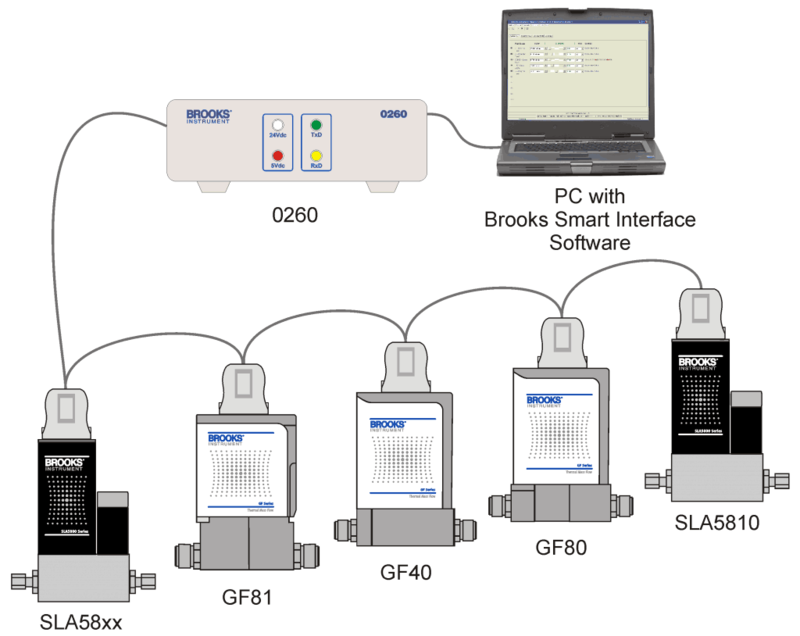 The 0260 power supply/converter from Brooks Instrument along with the Smart interface software can control up to 30 devices. Both of these products will communicate with any Brooks Instrument MFC or electronic pressure controller with the RS485 Smart Protocol, such as the GF40, GF80 and SLA5800 Series. Other than the 0260 power supply, the only piece of hardware required to set up the network is a multi-drop cable. 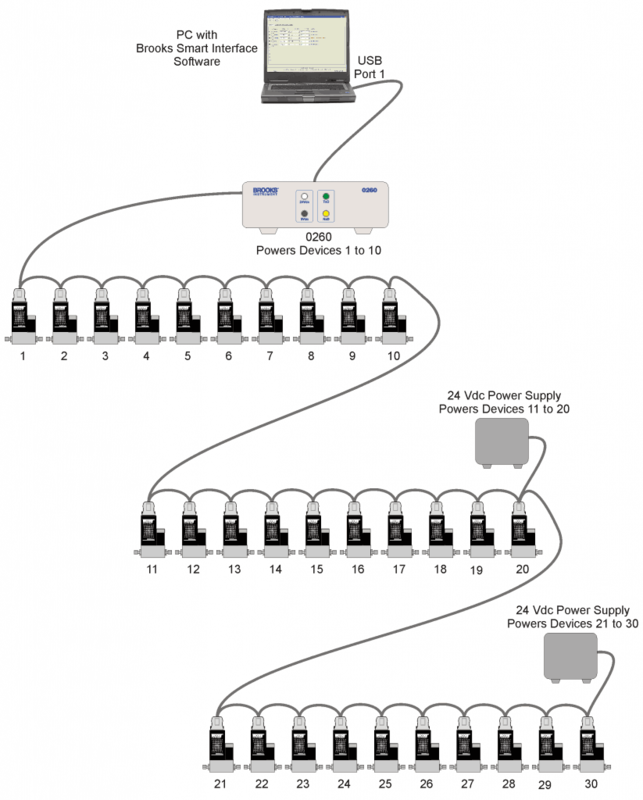 The images below show different ways to set-up a network with more than 10 devices. If you need assistance setting up devices in an RS485 network, please contact our Technical Services team or your local Brooks Instrument representative for assistance.